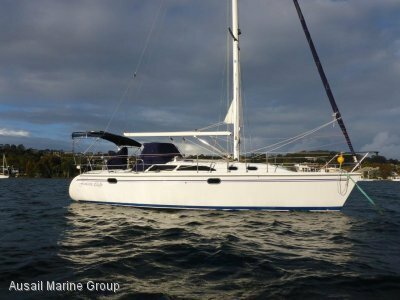 This Catalina 309 presents in "as new" condition and would suit a buyer looking for a new yacht. 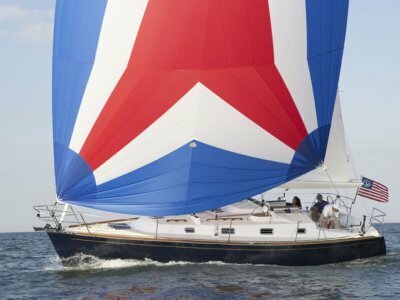 The Catalina 309 is the perfect sized yacht for single-handed or couple sailing without compromising all the features only found on larger yachts. 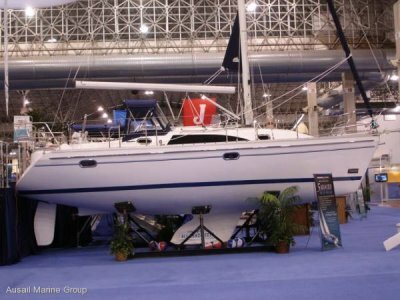 The Catalina 309 had won the Cruising World magazine domestic-boat-of-the-year within months of launching. The design of the yacht is modern, but not too modern, with a full masthead rig with twin straight spreaders, sloping bow and raised - but not excessively so - cabin top. The sail plan has a traveller on the cabin top with most sail controls coming back to winches and jammers adjacent to the cockpit, with a pair of Lewmar two-speed 28STs on the cabin top for halyards and 34s on the coaming for sheets. The headsail is on a Schaefer 1100 furler and the furler line has been led aft, adjacent to the cockpit. A rigid boom vang, good-sized traveller and generous genoa tracks are other features. 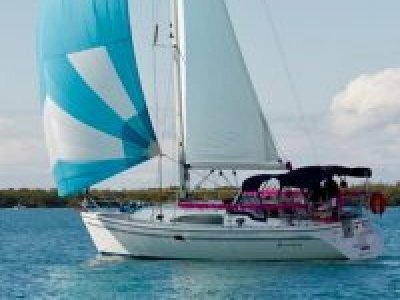 The Selden mast has in-mast furling as standard. Side decks are reasonably wide and only slightly cambered, with genoa tracks and shrouds well inboard, so going forward when it's rough should be relatively easy, aided by sturdy stainless-steel grab rails on the cabin top and a good non-slip surface. Aft are twin pushpit seats, each with its own drink-holder. An adjacent section of fibreglass serves as a helmsman's seat and unclips to let you walk through to the transom, where you will find a swimming platform with telescopic ladder (another improvement on the previous model) and a hot and cold deck shower. Stowage is courtesy of a large cockpit lazarette to port and two small lockers aft for gas and general gear. Gas-wise, there is room for a four kilogram bottle. 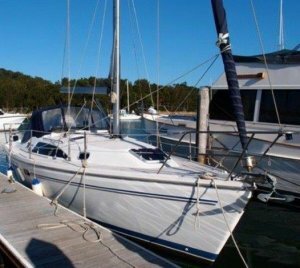 Catalina describes the 309 as a "wholesome family racer/cruiser combining good performance and great accommodation with contemporary lines and style". The forward cabin boasts a good-sized V-berth with a large hatch and stowage. Twin settees and dinette midships and at the foot of the companionway steps a U-shaped galley to port and navation station to starboard. There is a double berth aft to starboard under the cockpit. Engine access is phenomenal: a three-sided cover simply lifts up and away to give access to the three-cylinder Yanmar diesel. You feel totally secure in the galley, which is U-shaped and has the companionway stairs/engine cover on the other side, so it's easy to wedge oneself in. The 90L WAECO fridge with small freezer compartment ensures good refrigeration for local cruising and an in-counter adjacent stowage compartment could be used as an ice-box. The cook will also be reasonably happy with the gimballed LPG two-burner stove with oven, in-counter stowage compartment for dry goods and crockery stowage above on the hull skin. The sink is deep and inboard close to the centreline, so should theoretically drain even when heeling. The head houses a toilet, sink and shower with a curtain you can pull around you to contain run-off. There is a 64L Rotomoulded holding tank with Y-valve. The 42L hot-water tank is heated by engine or mains power. The 132L water tank is under the V-berth and the engine and house batteries (two by 150 amp-hours) under the aft berth. The instrument panel is well labelled and an ICOM VHF radio and a sound system are standard. The dinette table has a folding leaf on the starboard side, which - when raised - means you can reach the table from both settees. As an optional extra the L-shaped settee to port and table can be modified so you can convert them to a double berth. Saloon headroom is 1.8m and opening hatches and halogen lights proliferate. The decor is a mix of teak and teak veneers, beige headliner, the cream underside of the deck moulding. Decks are balsa-cored with knitted laminates for strength, and the hull has a vinylester skin coat. All rigging loads are tied into integral longitudinal structural aluminium beams. Solid fibreglass stringers and transverse structural members are an integral part of the hull. The transom is made as part of the hull mould rather than the deck mould which means fewer joins in the close-to-water vulnerable areas.